I am thou. Thou art I. From the sea of Atlus’ soul comes an Persona 5 R announcement. After the Phantom Thieves conclude their story in the Persona 5 the Animation: Stars and Ours’ hour long special on March 23, 2019, information about Persona 5 R will appear. The Japanese Persona Twitter account confirmed the news and said that the information will come via a commercial message. The special ends at 9:00 pm JST (5 am PST). Will you “Wake Up, Get Up, and Get Out There” for this early announcement? specifically, the tweet said, “A # P5R follow-up will appear the main story… Don’t miss it, everyone!” It specifically said it will be revealed in a commercial of some sort. This news may ramp up and leading into SEGA’s Fes 2019 event, which will be taking place over March 30th and 31st. 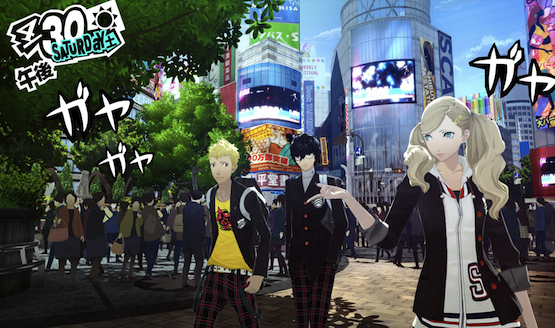 Persona 5 was prominent in the company’s blog post and will be on the main stage. Perhaps this advertisement will be a way to get more people to come to the event? Persona 5 R is speculated to be an updated version of the game and has been rumored to possibly get both a PS4 and Switch release. However, Atlus previously teased Persona 5 R with the PlayStation logo introducing the video. Persona 5 Arena has been hinted at by Blazblue Cross Tag Battle Producer Toshimichi Mori. He told Compete that they will not be adding new characters from the Persona series to the crossover title, because he wanted to save them for “future projects.” Persona 4 Arena Ultimax came out in 2014 for the PS3, so it’s been a while since the last Arena game. The only upcoming Persona title we know of right now is Persona Q2: New Cinema Labyrinth for the Nintendo 3DS, which has characters from P3, P4, and P5. Persona 3: Dancing in Moonlight and Persona 5: Dancing in Starlight, music-rhythm takes on the RPG series released in December 2018.